Apartments in Belgrade - Apartment Zvezda is located nearby Vuk monument, on Brace Ribnikar street. This modern short rent apartment is on the second floor in the building without elevator. 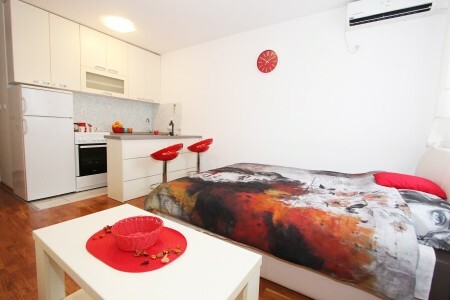 Completely equipped apartment is suitable up for 2 people. It consists of room with double bed, completely equipped kitchen with bar and two bar chairs, and bathroom with shower. At the guest disposal are air conditioning, central heating, wifi, LCD TV, washing machine, clean linen and towels. 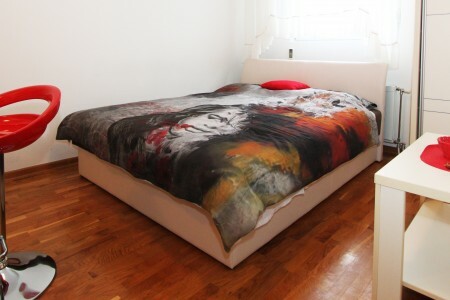 Apartman Zvezda is located in the quiet part of Belgrade, but not far from the city center. Nearby is located shopping mall Zira, cafes, bakeries, shops. Only few steps there is bus station so it is easy to reach other parts of the city. For the guests of apartment, there is parking place near the building but place is not reserved or garage place for 5 euro extra charge per day.